Raquel is back from maternity leave, starting Feburary 2017! Raquel is passionate about well-being. Her grandparents are from the Japanese island of Okinawa, where they have the largest proportion of centenarians in the world.Her interest in health and the hope for carrying those good genes led her to pursue a career as a wholefood chef for about ten years. 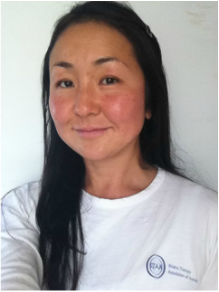 As a natural transition, Raquel studied Shiatsu, a Japanese body work therapy based on Traditional Chinese Medicine. Raquel is a member of the Shiatsu Therapy Association of Australia (STAA) and offers health fund rebates through most private health providers in Australia. Her love for the body and mind connection has taken her to a dedicated Yoga practice path, and recently to Aikido as well. She is interested in people and their stories, and she invites you to try this powerful and gentle therapy to help you tune in to your own flow. Please feel free to call Raquel or send her an email for a friendly talk about you.